Earlier today I visited an exhibition in London commemorating the killing of 500 Palestinian children by the Israeli IDF forces in last years Operation Protective Edge. The show, entitled, ‘If I Wasn’t There’, as part of the Gaza In Gaza exhibition at the P21 Gallery (until 22nd August) (1) was an extremely moving experience. 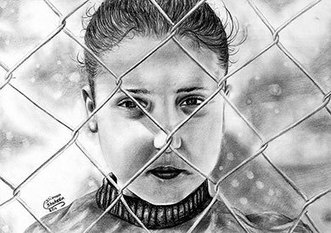 The show focuses on 400 individual pictures that depicted an activity or action Palestinian children might of undertaken had they lived through Protective Edge. The pictures were made on behalf of those who died – and thus their voices – simply because they were in the wrong place at the wrong time. ‘If I wasn’t there I’d be riding a horse’. ‘If I wasn’t there I’d be doing the gardening’. ‘If I wasn’t there, I’d be measuring how much I had grown’, were just three of the 400 themes on display. Artist Majdal Nateel, who lives in Gaza, uses images drawn on cement bag fragments to bring home to devastating effect the innocent young lives stripped of their potential by the inhumanity and illegality of Israel’s oppression of the Palestinian people. During the latest Israeli phase of ethnic cleansing that inspired the exhibition, the artist was working for the U.N and alongside children in shelters. “When I draw I like to think like children as if everybody in all the cities were happy”, says the artist. “I am dedicating my artistic tools to talk on behalf of the children who lost their voices simply because they were here, or there….. If I Wasn’t There’ is about this: if I hadn’t been here, then maybe my mother would now be brushing my hair or making my favorite food, maybe my clothes size would have changed and maybe I wouldn’t be just a statistic broadcast on the news.” (2). The canvas Nateel uses is highly symbolic as it represents fragments of the few cement bags (cement is a precious resource in Gaza) given out to the families whose thousands of homes were bombed. These, in addition to the scores of schools and nurseries in Gaza, still lie in ruins. The intention of the artist is to elevate the plight of the children killed above the euphemism of collateral damage regularly attributed by power to those who die in conflicts. Nateel’s direct critique of war follows in a long tradition going back to at least the naturalism of Goya in the early 19th century but perhaps even more aptly to the symbolism of Picasso in the 20th. This exhibition deals head on with the impact war has on human beings. A very powerful project. I wonder how many people would pay a pound/dollar/euro for a piece of Gazan rubble ? It could be their foremost export and , current stocks considered, could earn millions in exports. Imagine the publicity !. I suggested this to George Galloway but without reply. Great idea. I’ve written to Galloway in the past and have never received a reply.